Before I left on my summer holidays I was able to complete a large portion of the floor. 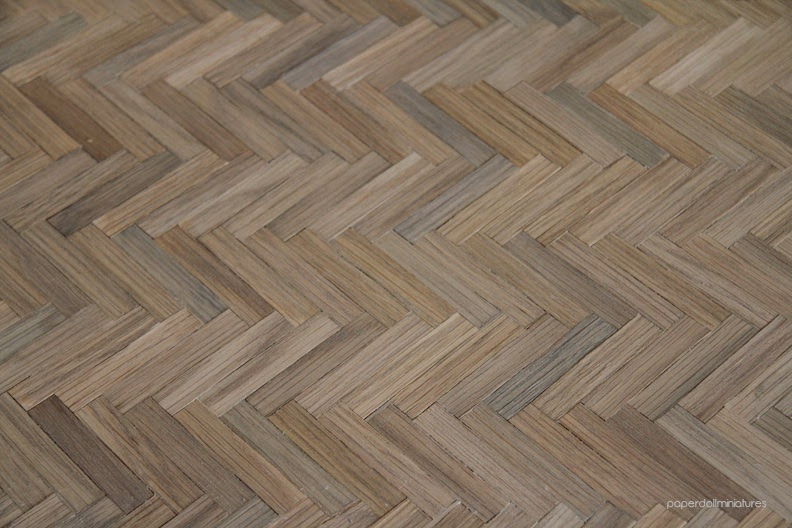 I had looked around at different hardwood designs and loved this London residence, the Taluba Rasa, with the matte contrasting planks set in a basket weave. 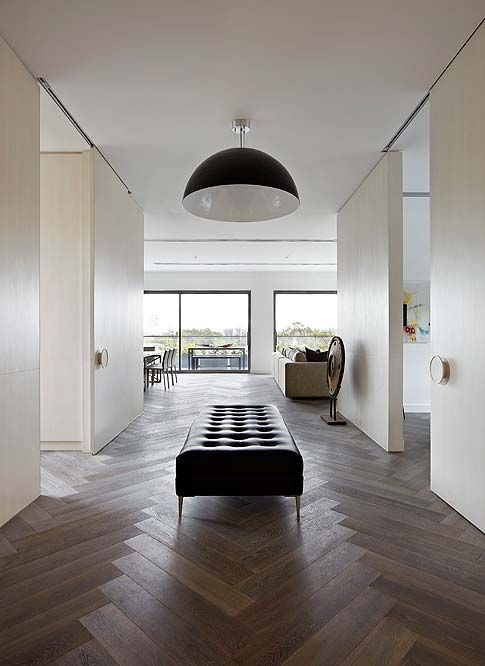 I decided to look for something a little less complex and found I really like contemporary spaces like this one with traditional flooring and very modern decor and furnishings. 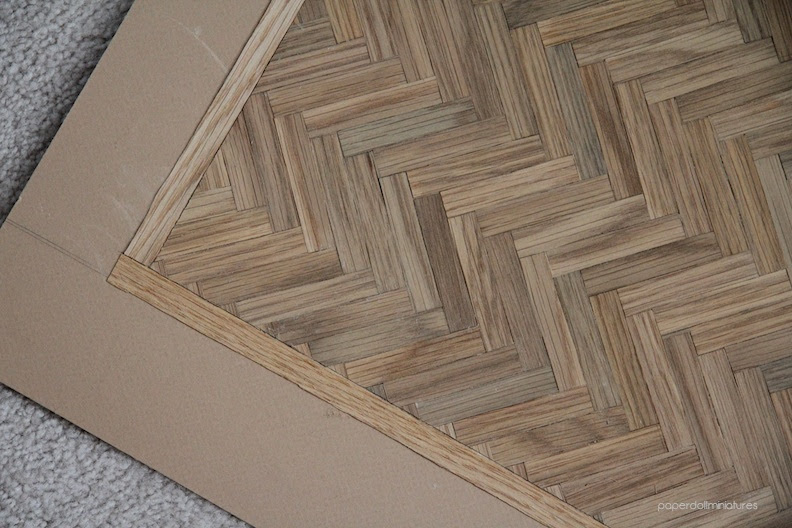 I settled on an oak floor with an oversized wide plank, a matte finish, and laid in a herringbone pattern. My floor will also have boarders around cabinets or transitions between rooms. 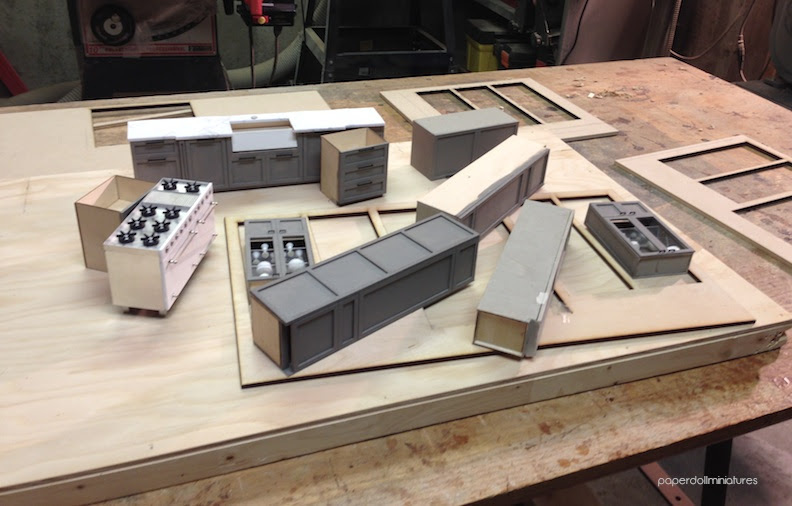 I took everything down so that the structure could be made of 1/4" MDF. 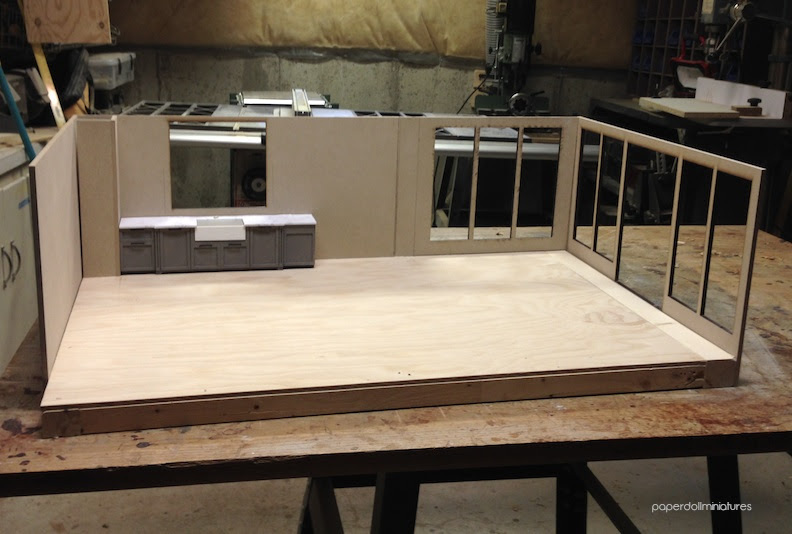 I also added in an extra window on the back wall which added another 3" to the width of the room... (the good/bad of making a custom dollhouse!) You can see the extra strip on the bottom right. The original didn't include a dining space but I like having the option now. Now with the room ready to go I went out and found veneer for my floors at a local wood shop. 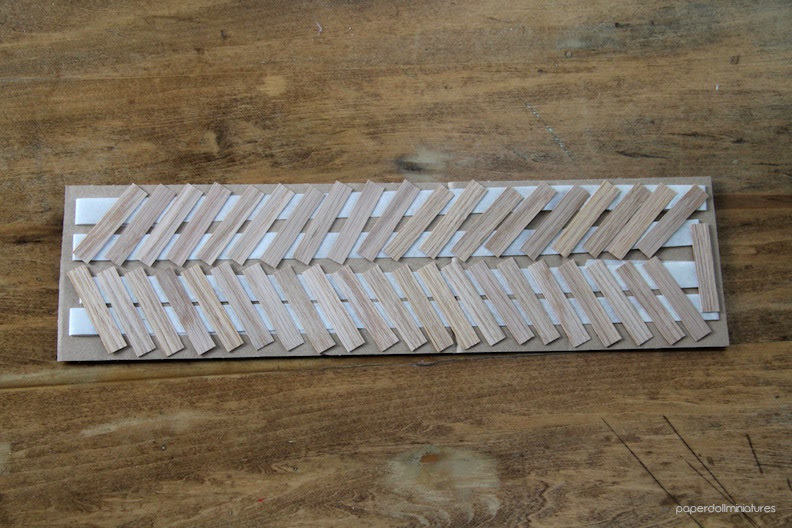 Originally I was going to do a mix of birch and oak, but after doing a test piece I decided to only use oak. This particular variety was labeled as "white oak". I used a paper cutter to slice my pieces in 0.5" x 2.5" to get that modern look I was going for. I only had to change the blade once for 300+ pieces! 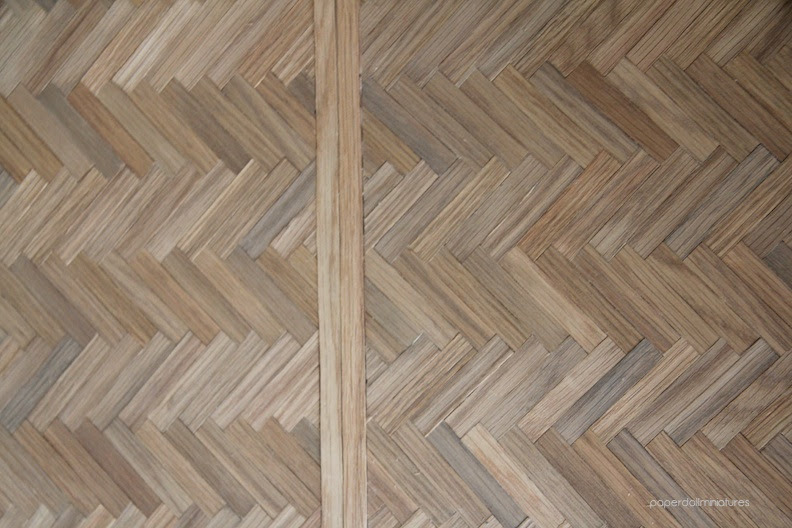 Please beware that oak likes to split with the grain so whereas birch cuts more smoothly and straight. The next step was inspired by Otterine's timely post, I followed her example and used masking tape to secure the pieces for staining. I like this method better because I didn't have to worry about the glue ruining the stain application. After with different mixes of Minwax stains: Natural mixed with either Weathered Oak, Special Walnut and Classic Grey or a combination of all three. The dominant colour was Weathered Oak. 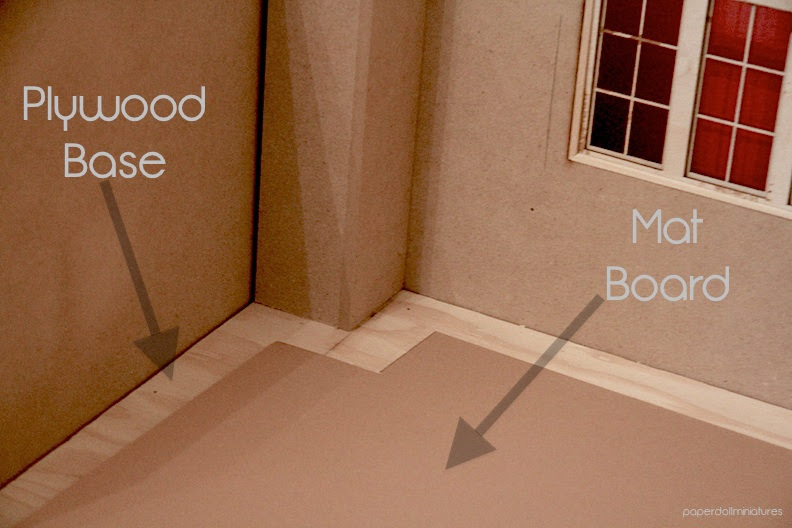 The subfloor is a piece of mat board with brown paper covering to fit the base of the room. 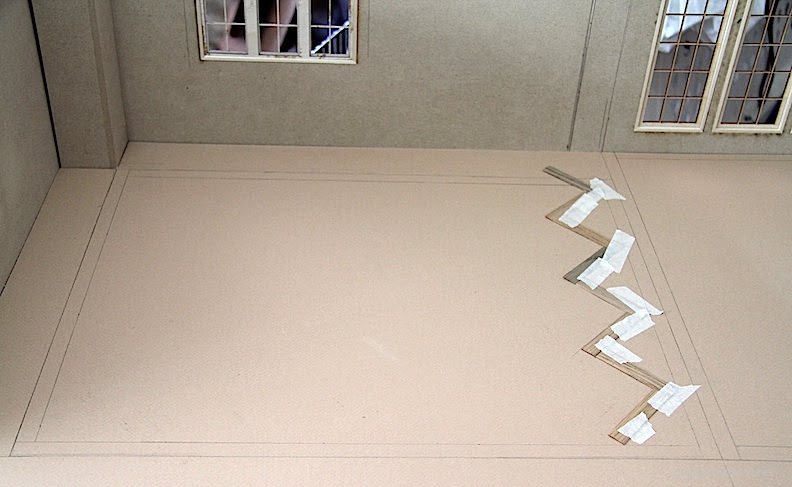 Notching out the corner where the walls point out. 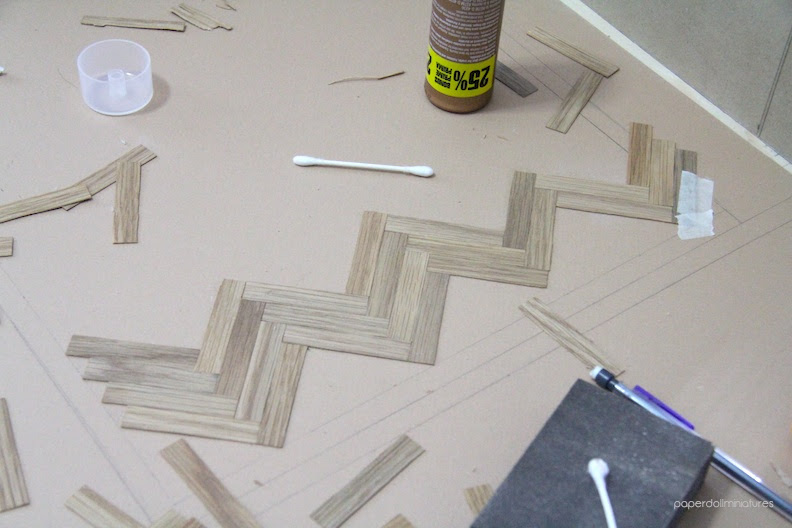 The design is drawn in pencil taking into consideration the lay-out of the cabinets and marking where I wanted the herringbone pattern and the boarders. I decided to have two separate areas. 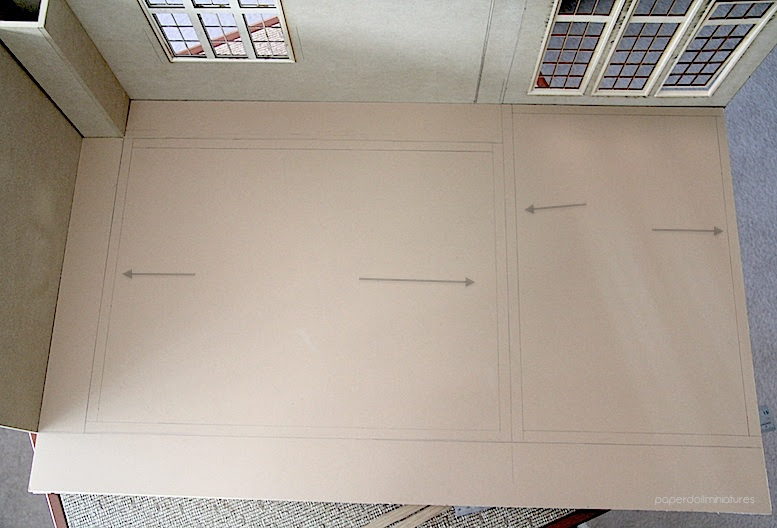 The most difficult part was laying out the initial pattern. I still have no idea how to get the design down with mathematics even after reading several real life hardwood laying sites. So I did some guess work and just played around until they formed a line and taped it down. If anyone has any helpful hints as to a how to measure this out please let me know so I can do it properly in the next room. 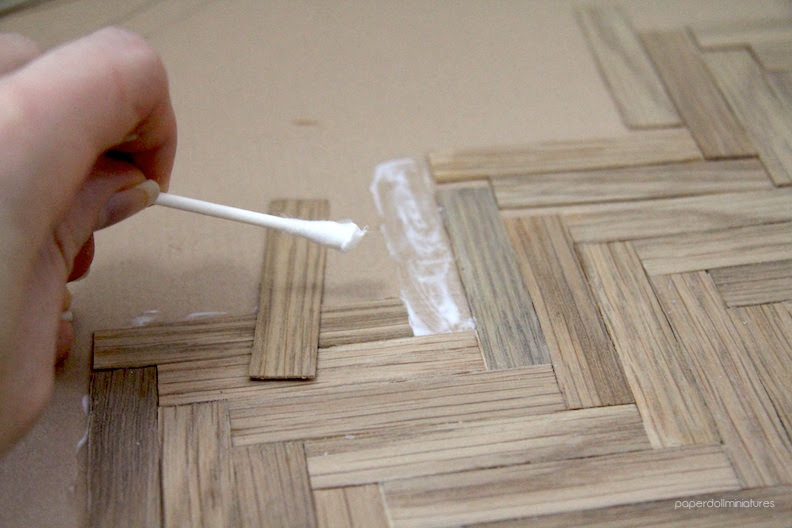 Each piece of wood is glued using Alene's Craft Glue and a Q-Tip. This glue dries really fast! Any boards that seemed to lift up just needed an extra press of a finger. No heavy weight required. 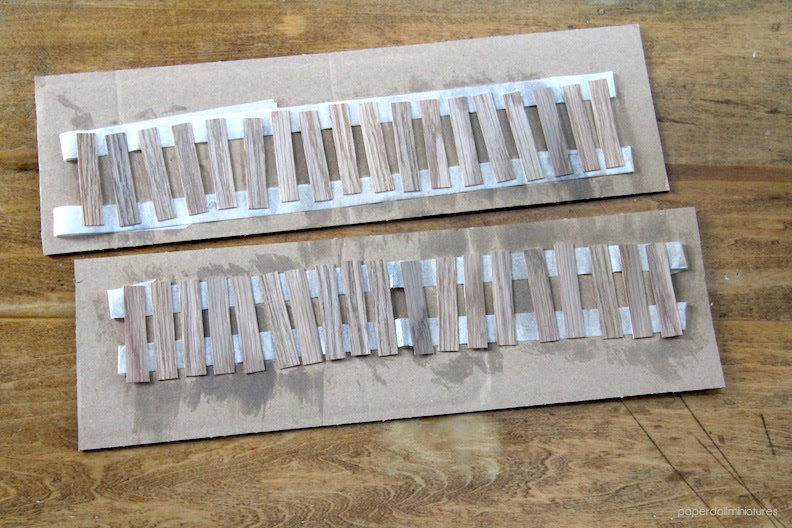 I had a couple of gaps which I filled with thin silvers of discarded stained boards. I only finished the edges at the end. 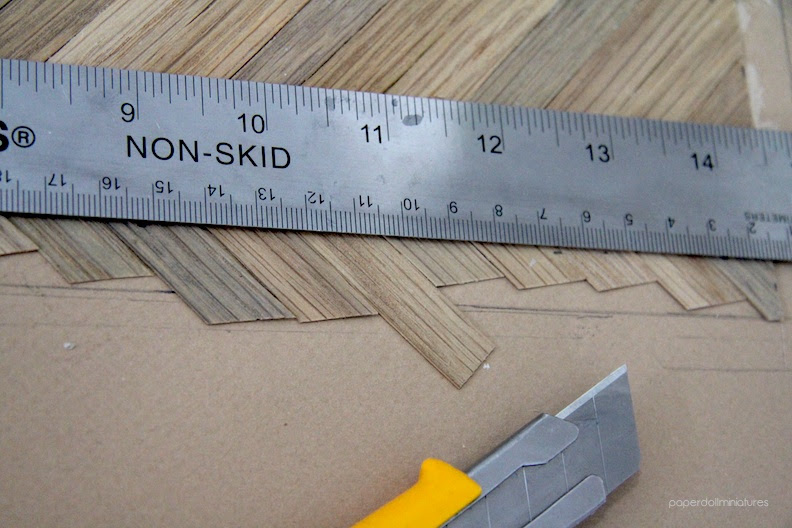 I measured again the boarder in the places where the pencil had been covered and used a craft knife to cut one straight edge. For now I've added long strips of unfinished oak for effect. 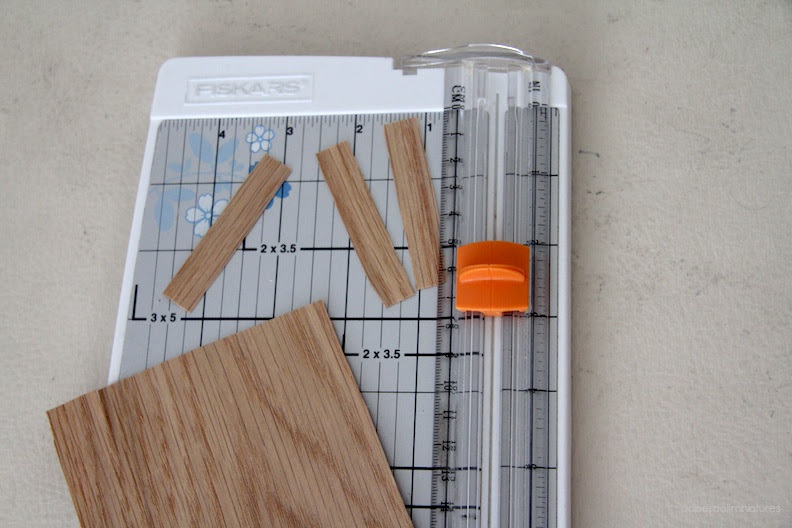 I plan on cutting proper strips and staining them in the coming weeks when I return home. It came out wonderfully and you make it look so easy! Well worth the blood, sweat and tears. Amazing! You deserve another vacay just to recover from the floor. Nice work. 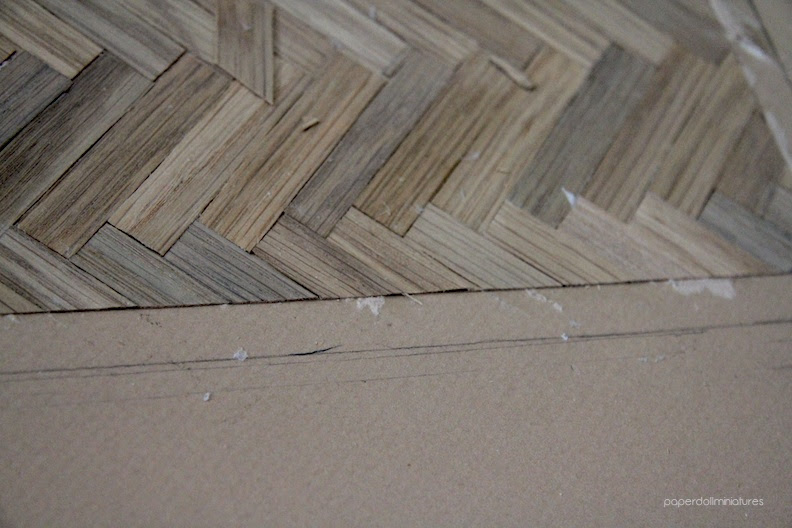 I tried once in my project and i know how can be difficult to make a floor. Great work on the floor! The floor looks great! And I love the chairs! 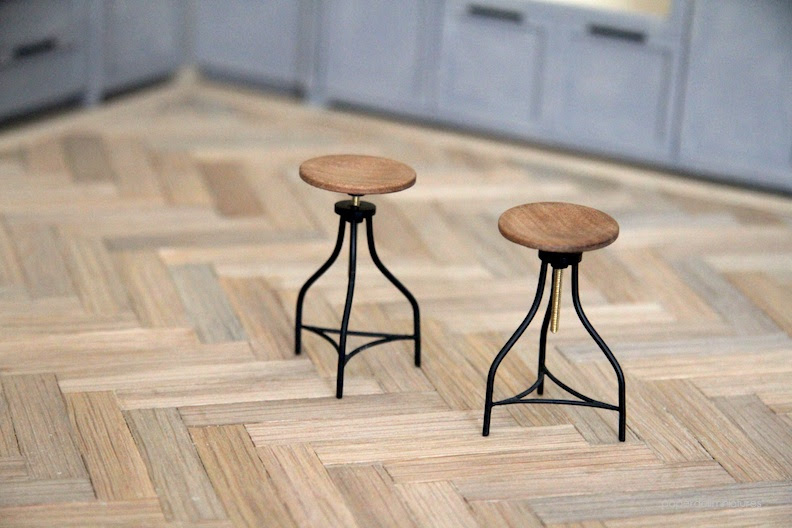 Love your flooring, so happy i found your blog. Looking forward to reading more posts and looking around. 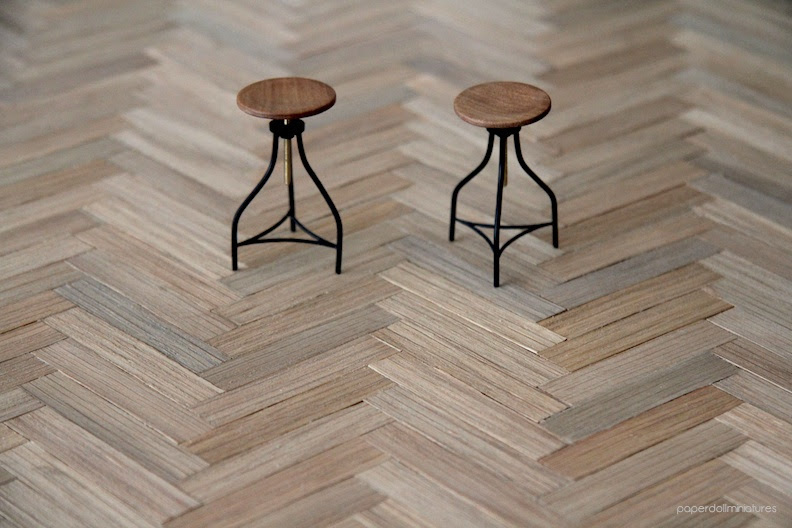 Beautiful flooring. Definitely worth all the work. The floor is beautiful. I will have to try this technique. Thanks for the post and great photos. 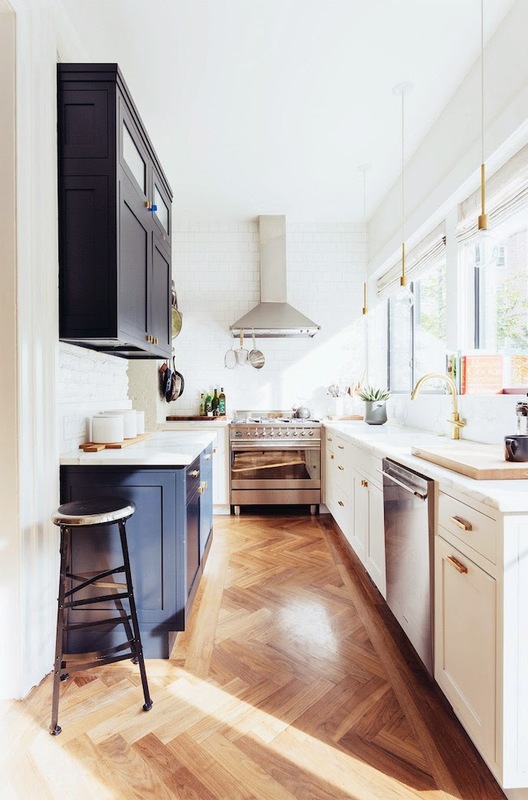 That floor is looking fantastic!…and the color (love). This mini kitchen is perfect! This is beautiful I've always wanted to try this. You make it look easier than I thought it would be. Thank you for sharing.